Marygrove College - New Marygrove Athletics App Available Now! Marygrove College Athletics announced Thursday (August 8) the release of a free mobile iOS application for the iPad and iPhone. The release follows a long line of communications enhancements over the past year for Marygrove’s athletic department. The app can be downloaded at no cost on the iTunes app store HERE. 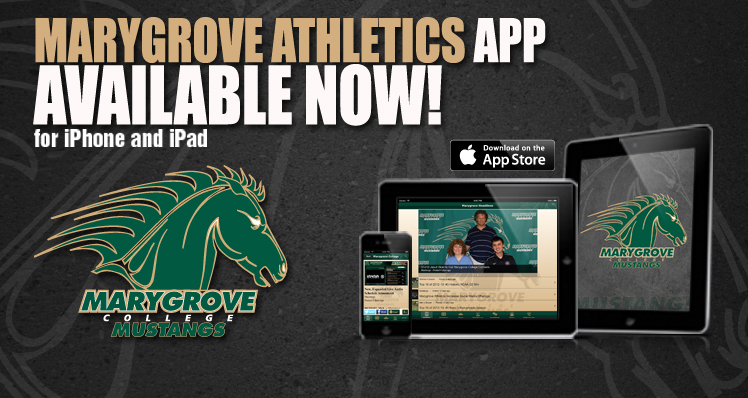 Designed for the community to stay connected on the go, the app acts as a mobile host to information provided on the athletics website, MarygroveMustangs.com, and the department’s social media channels. The app, created by the department’s website-hosting company — SIDhelp â was officially released after Apple, Inc. approved the final version for the iTunes store in late July. Currently, SIDhelp has the app available for select portable apple devices with plans for an Android version in the near future. With the app, fans can read the latest headlines and game recaps, check up on recent news within the department, access student-athlete and staff bios, view team schedules, get connected through the various department social media channels, and even watch or listen to live events when a Wi-Fi connection is available. “Last year, we began to brand our program under the ONE TEAM, ONE GOAL, ONE MARYGROVE moniker in an attempt to bring our community, athletic department, and student-athletes together as one,” stated Dave Sichterman, Director of Athletics & Wellness. “As a department, our branding is stronger than it has been in the 13-year history of Mustang athletics due to our online accessibility and the effective communication of those tools,” Sichterman added. In June, the athletics website â MarygroveMustangs.com â placed 10th nationally in the NAIA outsourced website category. The award acted as a launching pad for increased athletic communications as the department unrolled team-specific twitter pages, and a new live audio slate, to accompany the release of the new app. “The app, along with the other industry-leading acquisitions over the summer, has allowed us to take a great step toward strengthening the delivery of our brand as we prepare to communicate our message through more channels than ever before. The trendsetting offerings will truly give Marygrove student-athletes a first class experience,” Sichterman added. The Marygrove Athletics app is free of charge and can be accessed by visiting the App Store at https://itunes.apple.com/us/app/marygrove-college-athletics/id675086917?ls=1&mt=8, by visiting MarygroveMustangs.com, or searching “Marygrove Athletics” (search option may not display our app in the initial 24 hours of the release).